This is the official Booklikes page of San Francisco, indie author J.V.R. JVR's Readers are bypassing sleep! Here’s a tweet that was posted to JVR’s Twitter page just a few weeks ago. It seems that her fans are so enamored with her books that they are bypassing sleep. We are both thrilled and worried to hear this. Thrilled because it means that JVR’s books are going over well with fans and they love it. Worried because we hope that her fan’s love of her books wont compromise their schedules too greatly. 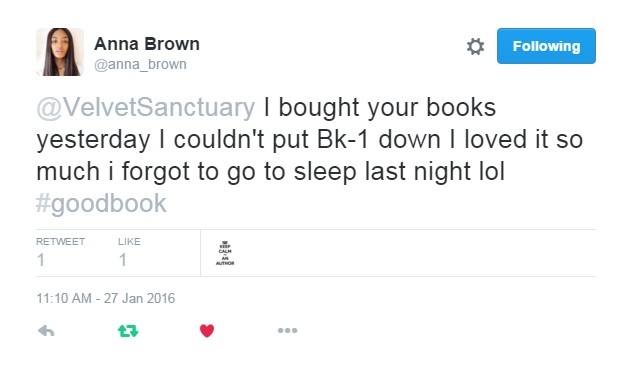 Shout out to Anna Brown via Twitter! We are thrilled to have another fan to add to our growing Fandom. Welcome all, and happy reading.